JJC Lens Cleaning Tissue is designed to gently clean all types of glass optics. These lens tissues will help you to keep your valuable optics free of smudges, dust and fingerprints, which can prevent clear viewing and affect the quality of your photographs. Each lintless tissue kit contains a wet wipe impregnated with non-alcohol lens cleaning solution, and a dry tissue which is a dry dust-free lens cleaning paper. 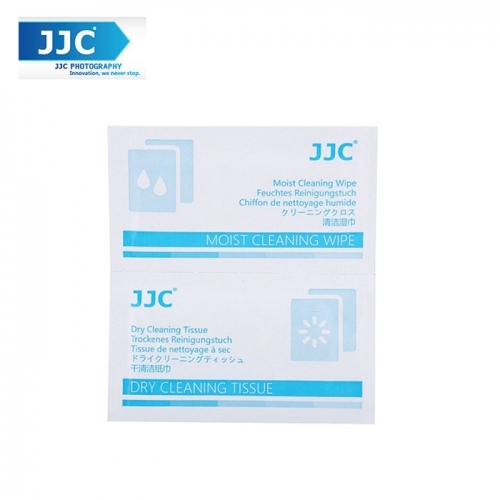 Made of lintless and non-abrasive material, JJC Lens Cleaning Tissue is perfect for camera lenses cleaning. - Safe for cleaning lenses, filters, screens, etc. 1.Use the wet wipe to clean the lens and remove smudges and fingerprints. 2.Then use the dry wipe to remove any moisture. For cleaning lens, it is recommended to use JJC Air Blower to blow the surface at first. The wet wipe is great replacement for lens cleaning solution which is not allowed when flying abroad.